Yesterday was the big day when Apple Santa Steve Jobs announced the 4th generation of their beloved iPhone model dubbed as iPhone 4. At the end of the day, they had also silently unveiled the next version of their flagship browser – Safari 5. 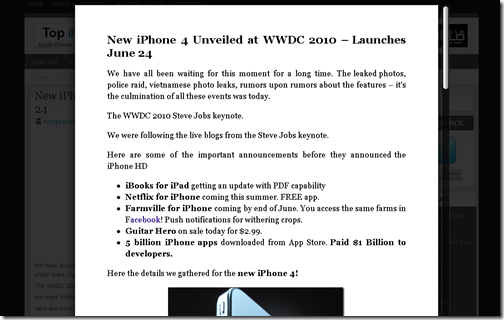 Safari Reader – Removes annoying ads and visual distractions and gets you the whole story. As you browse the web, click the Reader icon to see a clutter-free view of the article. Greater HTML5 Support – Full-screen view and closed captions for HTML5 video. Location services are also enabled. Bing Search – Not sure how big this is to most people but they have added Bing Search in addition to Google and Yahoo search. Smarter Address Field – aka Chrome’s Omnibar.